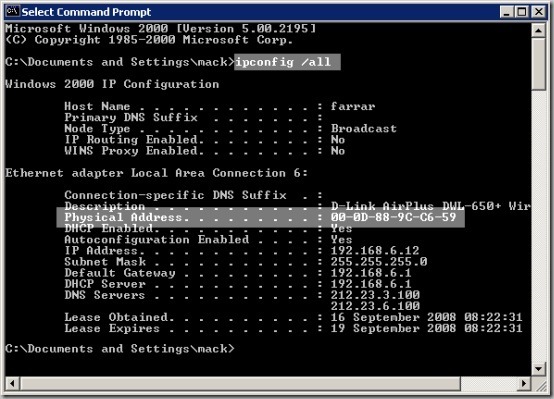 In stumbling around your computer’s operating system, or when setting up an internet router for your broadband access, you may have come across the term MAC address. It’s obviously pretty important for getting things talking on the internet, but what exactly is a MAC address? Well, in computer terms, a MAC address certainly isn’t the address of your local fast food joint where you can order an oversized cheeseburger and large fries, but it is fundamental to the operation of your computer on a network. So if you’d like to know a bit more about the ins and outs of a computer’s MAC address, rather than the contents of a McDonald’s deep fat fryer, then scroll down on your McMouse, or tap on your McKeyboard and read all about it. The term MAC is an acronym for Media Access Control. A MAC address is also sometimes referred to as an Ethernet Hardware Address (EHA), hardware address, adapter address or physical address. A MAC address is essentially a unique, fixed serial number of your computer’s network card in a globally agreed format. This network card can also be referred to as a Network adapter or Network Interface Card (NIC). For practical purposes, the MAC address of a computer’s network card is globally unique and fixed to the network card in the computer. If your computer has more than one network card, then each network card will have it’s own individual MAC address. If a network card were swapped from one computer to another, then the MAC address would follow the network card to the new computer. Network cards in computers are used to send data from one computer to another over a network, either via a local office network for example, known as a Local Area Network (LAN), or across an much bigger external network like the internet, known as a Wide Area Network (or, you guessed it, a WAN). Network cards can either use physical cables (traditionally CAT5 with standard RJ45 connectors that look a bit like big telephone connectors), or they can use wireless (WiFi for example) to transmit their data. In either case, wired or wireless, the network card will have a unique MAC address associated with it. When we configure computers to talk to each other over a network, we tend to use IP addresses as their primary means of identification. These IP addresses are a bit like the computer equivalent of telephone numbers. If you’re not familiar with IP addresses then my previous post, interestingly titled What is an IP Address? may help. MAC addresses are the nuts and bolts of what makes the IP addressing system work and are more fundamental to the operation of the internet and the transmission of data between machines than IP addresses, as they uniquely identify each physical data point on a network. The relationship between an IP address and a MAC address is a bit like in a car, where the car’s registration or licence plate is like a computer’s IP address. It uniquely identifies the vehicle, but isn’t too difficult to change if required (for legitimate or illegitimate purposes). Similarly with computers, it’s quite easy to change an IP address. A MAC address is a bit like the serial number of the vehicle’s engine. An engine is closely tied to the vehicle, although it’s serial number is not used as the vehicle’s primary identifying method. Like a MAC address, an engine’s serial number is much more difficult to change than the vehicle’s licence plate. A further similarity with MAC addresses is that if the engine is put in a new vehicle, then the serial number follows the engine, and doesn’t stay with the old vehicle. So where are you likely to come across MAC addresses in your every day use of a computer? Well, you’ve probably heard a lot about securing wireless networks to prevent unwanted users from piggy backing onto them and surfing for free. One way of doing this is to set up the Wireless Encryption Protocol (WEP) on your router to encrypt all of your wireless data. Another way often offered by wireless routers is to make the router only available to known MAC addresses. To use this method you need to add a list of authorised MAC addresses to your router or broadband modem. These MAC addresses should be the addresses of the wireless network cards in the computers that you want to have access to the internet. Your wireless router should give you instructions on how to do this. Unfortunately it isn’t obvious where to find your MAC address in case you need it. If you’re running a Windows PC, you can find it by going to Start, Programs, Accessories and open the Command Prompt program. A new black window will open, in which you will need to type ipconfig /all and then press the <enter> key (see highlighted below). The window should then display a whole load of information about all of the network cards in your machine. The MAC address for each network adapter is displayed as its physical address (see highlighted below) in this case 00-0D-88-9C-C6-59. Not strictly true. We could have 41,000 network appliances each. I would hardly call my power switch or HiFi system a “computer”. Great post, but that won’t seem to make use of my router ip, any hints? External programs on the internet will only be able to show your IP address. If you want to see your MAC address, you need to follow the instructions in the post really.